We hold immense expertise in manufacturing, exporting, trading and supplying a vast assortment of Hair Oil Bottle Filling Machine. These are known for their exceptional properties in terms of durability. we offer various models for filling of hair oil bottles. Hair oil bottles are in various shapes to be taken care of handling during filling and with accuracy of volumes in the bottles. 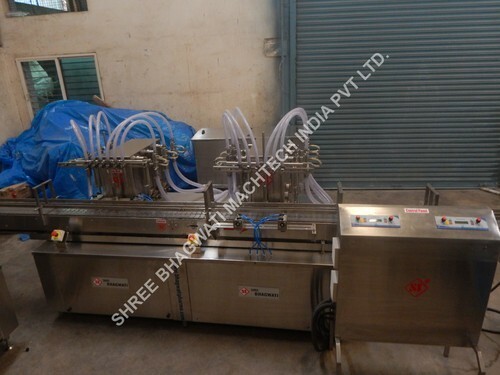 Our range of machines offers filling volume from 10 ml to 1000 ml in all shapes and sizes of bottles, be it glass bottle, Pet Bottle or HDPE bottles in round shape, oval shape, flat shape, square shape or any special shape of bottles provided by the client. Bulk filling in volumes of 5000 ml also made available with specially designed machine for handling large containers and speed of volume filling.